Pepes Klengis (Celengis; Telengis) still feel strange to the ears. 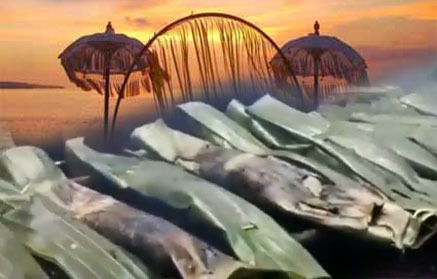 However, this traditional Balinese side dish is in demand by many people. This food is very tasty and is perfect for making your lunch. Klengis is a culinary ingredient with the main ingredients in extracting pulp from coconut oil. This Balinese culinary taste is very sweet, savory and fragrant. This is because the raw material for making this culinary comes from oil porridge. Regarding the ingredients used, this culinary even uses spices which are complete spices which have become the basis of various Balinese specialties. Pepes is not just plain without additions in it. Pepes is often given additional shrimp in it. So it's more fun. Pepes prices are also quite cheap. Only around IDR 2,000 to IDR 2,500 Rupiah only. Only with warm rice and pepes, it tastes quite good. Because it tastes good, don't be surprised if you don't only eat one packet of pepes. You must be able to spend more than two packs of pepes. Not just for friends to eat. But it can also be a tasty stomach booster snack. The taste that is good doesn't need to add flavor anymore. So, who says Bali doesn't have unique cuisine? It is proven that Pepes Klengis is also quite tasty but the price is still relatively cheap. Come on, don't forget to taste this typical Balinese cuisine when you travel to this Island of the Gods. Because you can only enjoy this cuisine in Bali.